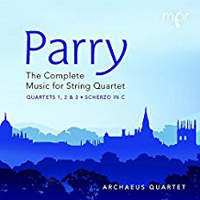 Description: The third quartet appeared four years ago this month (see July 2014, 07Q055) but the rest are first recordings, the second and the scherzo edited for this recording by Parry specialist Jeremy Dibble who also wrote the notes. Nos. 1 and 2 are quite early, from 1867 and 1868 are look primarily to Mendelssohn for inspiration with the second’s slow movement a love-note to Parry’s wife to be, her name musically encrypted at its end. Youthful material but very attractive. 2 CDs. Archaeus Quartet.